Israeli forces invaded Bil’in once again just before 1am. Six jeeps entered the village via the gate in the occupation wall. Two jeeps stopped at the house of Mohammed Ahmed Yasseen (age 21) and searched for him in the ground floor apartment belonging to his mother. Four jeeps stopped at Abdullah Mahmoud Aburahma’s (age 37) house and searched for him there. Two of these jeeps left quickly to search for Yasseen Mohammed Yasseen (age 21) at his home. None of the men were at home and no-one was arrested. 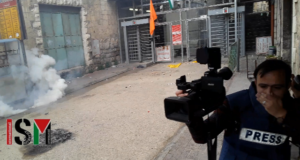 International and Israeli activists accompanied local Palestinians at all three locations to protest against the invasions and to document events. The house searches were relatively short-lived, compared to the numerous previous invasions. The soldiers delivered letters to all three families demanding that the three men go to Ofer prison to meet ‘Captain Fo’ad’ of the shabak. This was the first time such a demand was written in Arabic. The invading forces were particularly aggressive at Abdullah Mahmoud Aburahma’s house. They fired tear gas and shot live ammunition in the air as they exited the village a little before 2am. No-one was injured or arrested. Palestinians in prayer shot with rubber-coated steel bullets, tear gas.